The trochlear nerve is the fourth paired cranial nerve. It is the smallest cranial nerve (by number of axons), yet has the longest intracranial course. It has a purely somatic motor function. The trochlear nerve arises from the trochlear nucleus of the brain, emerging from the posterior aspect of the midbrain (it is the only cranial nerve to exit from the posterior midbrain). It runs anteriorly and inferiorly within the subarachnoid space before piercing the dura mater adjacent to the posterior clinoid process of the sphenoid bone. The nerve then moves along the lateral wall of the cavernous sinus (along with the oculomotor nerve, the abducens nerve, the ophthalmic and maxillary branches of the trigeminal nerve and the internal carotid artery) before entering the orbit of the eye via the superior orbital fissure. 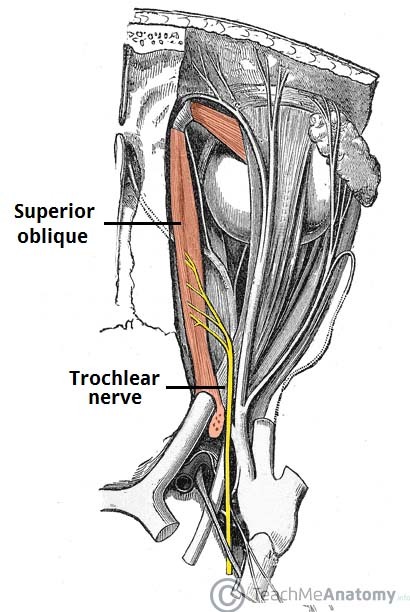 The trochlear nerve innervates a single muscle – the superior oblique, which is a muscle of oculomotion. As the fibres from the trochlear nucleus cross in the midbrain before they exit, the trochlear neurones innervate the contralateral superior oblique. The tendon of the superior oblique is tethered by a fibrous structure known as the trochlea, giving the nerve its name. Although the mechanism of action of the superior oblique is complex, in clinical practice it is sufficient to understand that the overall action of the superior oblique is to depress and intort the eyeball. Fig 2 – Lateral view of the extraocular muscles. The trochlear nerve is examined in conjunction with the oculomotor and abducens nerves by testing the movements of the eye. The patient is asked to follow a point (commonly the tip of a pen) with their eyes without moving their head. The target is moved in an ‘H-shape’ and the patient is asked to report any blurring of vision or diplopia (double vision). Trochlear nerve palsy commonly presents with vertical diplopia, exacerbated when looking downwards and inwards (such as when reading or walking down the stairs). Patients can also develop a head tilt away from the affected side. They are commonly caused by microvascular damage from diabetes mellitus or hypertensive disease. Other causes include congenital malformation, thrombophlebitis of the cavernous sinus, and raised intracranial pressure. 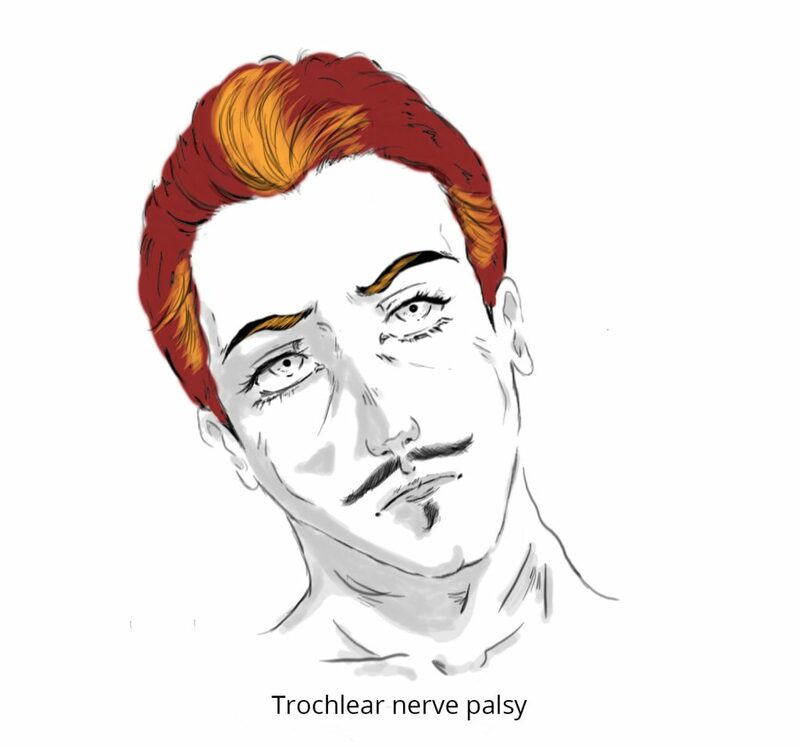 Fig 3 – Left trochlear nerve palsy, characterised by vertical diplopia and head tilt away from the affected side. What is the function of the trochlear nerve? What is the only muscle innervated by the trochlear nerve? Through which structure does the trochlear nerve enter the orbit of the eye?